New Arrival!!!! All Aluminum, Custom Built Pluckebaum!! Here is your chance to own a one of kind boat. The owner has little time to enjoy boat so he made the tough desion to let it go to a new owner!! Featuring twin Caterpillar 3208 Diesels, 12.5 KW generator, twin Jet ski garages aft of boat (jet skis included) factory installed enclosed bridge with heat and air, two estate rooms, full galley and wide 17 foot beam make for a super spacious boat Inside and out. Perfect for loop, lake, intercostal and Bahamas! Fresh water boat that is in a covered slip. Owner is motivated and will entertain all serious offers. 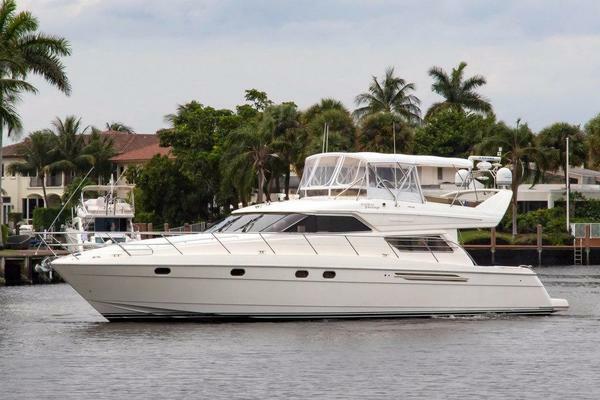 United Yacht Sales New Jersey would love to guide you through a personal showing of this 54' Pluckebaum Sport Cruiser 1992. This yacht for sale is located in Buchanan , Tennessee and priced at $229,900. For a showing please contact us by filling out the form on this page and we will get back to you shortly!